FCER is an all volunteer non-profit group dedicated to the rescue of horses, burros, and mules: their rehabilitation (both physically and mentally), and their adoption into good, loving homes. 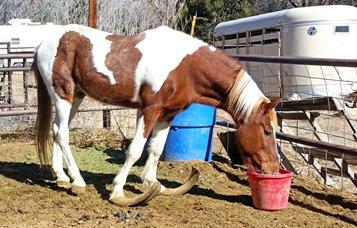 We will assist wherever, whenever we can, to help horses in need. Located just outside Aztec, in the Four Corners area of New Mexico,we follow the guidelines for rescues as set forth by the AAEP (American Association of Equine Practitioners). This guide can be viewed by clicking on the Forms icon, then AAEP. Dreamer was an emergency rescue and saying “We can’t take him” wasn’t an option. Dreamer is an 11 year old stallion. He’s been in his pen so long he was standing on 2 to 3 feet of his own manure. He was born on the place we got him from – never haltered or feet done – essentially never touched. We were alerted to his plight by the granddaughter of the person who had him. 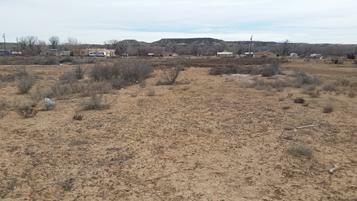 We have finally purchased additional land close to our main facility! 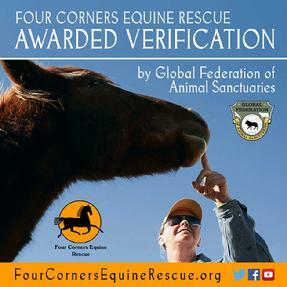 FCER has been awarded Verification Status by the Global Federation of Animal Sanctuaries! GFAS is the only globally recognized organization that provides standards for animal sanctuaries. This is totally voluntary on the part of FCER, and we did it to hold ourselves accountable and to provide our donors assurance that your donations are well spent! Barn Tours are your opportunity to come out and visit the horses with a guided tour of the facility. Volunteer Orientations are to sign up to be a volunteer at FCER. Want to Receive Updates on the Happenings? Just send us an email to debbie@fourcornersequinerescue.org and write subscribe in the subject line. We'll add you to our email list, its that simple! We DO NOT share our list with anyone else. All material and images on this site are the property of Four Corners Equine Rescue and may not be copied or reproduced without express permission of FCER.